Shane Morris is already known for his numerous collaborative projects, among them his co-work with Mystified on “Inspired Evolution” trilogy is the most famous (released on Spotted Peccary during 2012-2014), while Paul Casper, the sole creator behind praised Frore project, celebrates here his debut in a cooperative effort. “Blood Moon” CD was released at April 3rd, 2015 on Spotted Peccary Music, just in time before the total lunar eclipse. The album is packaged, as usual for this sympathetic Californian label, in a catchy 4-panel disc eco wallet designed by label’s visual masters, Daniel Pipitone and Jourdan Laik, who is also credited for the original photography. Mastering is handled by Ben Cox of Lotuspike clan. Equipped with wide range of electronics and acoustic instruments such as didgeridoo, duduk, various flutes, udu, frame drum, shakers…, Frore & Shane Morris fire up their journey with 13-minute “Lichen Patterns”. Massively unfolding tides of drones are enigmatically merged with mesmerizingly circling Dreamtime artifacts, while subterranean organics and distant tribal beats gradually permeate and capture the front stage with its sharpened intensity. Masterful mix of primordial instrumentation with electronic enhancements spectacularly cascades and climaxes. Bravo, gentlemen, this is a truly mind-bending introduction!!! And don’t forget to put your headphones on, a true sonic revelation awaits!!! “Ritual Sequence”, clocking to 10-minute mark, safely keeps on exploring ancient terrains, again lushly flavored with powerfully shamanic percussive textures, which are precisely merged with sweeping atmospheric blankets. Some recognizable, yet ethereally embracing signatures sneak atop here and there, although the spectacle is also entered and highlighted by hauntingly evocative flute mastery. Wow, another top-notch tribal ambience!!! “Orison” glides through spellbindingly mysterious sceneries, masterfully bridging perplexing cavernous realms with ear-tickling dissonances, while intangible tribal groove rests above before fully awaking and stealing the ceremony. But the pinnacle is still to emerge, because shortly after that Paul rises his duduk, a traditional Armenian woodwind instrument, which immediately starts to reveal all its infinite magic. A jaw-dropping listening experience, magnificently expressive and monstrously rewarding!!! The use of duduk in ambient soundsculpting always leaves me breathless and “Orison” is no exception. Hats off to Paul & Shane, to me, an ultimate Hall of Fame composition!!! “Unfolding”, another 13 minutes long track, opens with transcendent didge curlicues, while warmly cinematic washes gorgeously meander. Slowly arising tribal beats become more vigorous and mesmeric and exquisitely interact with utterly expansive panoramas. Crystalline tinkles and organic subtleties harmoniously augment the Southwest desert feel of this strongly evocative piece. Another large dose of aural elixir for my ears is delivered here!!! 16-plus minutes long closing composition “Night Rapture” unveils with mindscaping nocturnal sounds, but vivid electro-industrial-infused rhythms join the stage, soon meticulously coalesced with machinery-like clickety-claks. Mysterious atmo zones are activated as well and intriguingly undulate across robustly-driven ethno tribal adventures, reinforced by rawer flute pervasions and outbursts. During the closing three minutes overwhelming intensity evanesces into a gorgeously encircling still of the night. A grand finale!!! “Blood Moon” is astonishingly refreshing addition to the genre, each track is slightly different, yet the entire mood is impeccably compact and delightfully complex. This stunningly full-bodied collaboration splendidly amalgamates creative insignias of two highly crafted composers and instrumentalists and brilliantly intermingles the primordial with the current. “Blood Moon” is another monument in tribal ambient soundcarving, certainly one of the best releases of 2015!!! I even won’t hesitate to use the word milestone, yes, that’s how breathtaking is this album!!! There are benchmarks against which any tribal/ethno-ambient album will inevitably be judged. You know the names, you know the common sounds and tones. Here’s the didge, here are the drums, here are the shakers and chants. There’s no need to go into the comparisons. The standard for this kind of work should instead be, “How far down into my primal/ritual self does this album take me?” For me, the answer with Blood Moon is: pretty far. Frore (aka Paul Casper) and Shane Morris do a great job of balancing off the things you’ve come to expect in a tribal release with deep ambient atmospherics, giving us a blend of ritualistic rhythmics and check-your-breathing meditative patches. Where this album really shows it strength is in the attention to minute details, the small sounds that create dimension, texture and inner vision. It’s that aspect that creates the strongest sense of immersion. Several points firmly catch my attention and cut through my usual tribal-loving rapture. “Orison” goes deep with a humming drone wavering its way across a mix of ambient washes and a slowly rising batch of drums. Just before the 4-minute mark, flute drops in to turn it into a slow and sensual dance. Balance again is key here, with everything kept at about the same level, which succeeds in throwing a kind of incense-haze veil around the music. Just slightly distant but very effective, it has a dreamy quality to it. Excellent didge work highlights “Unfolding.” Churning up perhaps the strongest of the influential references, it’s a deep flow with big ambient pads and the cool twang of a stringed instrument I can’t identify—but I know I love it sound and texture. “Night Rapture” is 16 minutes of curling-smoke washes, hypnotic percussion, and pure atmosphere. Breathy flute pushes through like a phantom wind to nudge your mind out of its reverie. This piece retains an edge of darkness and the repetitive churn of ritual as it draws you in. You could just loop this track for a while and your primal self would thank you. Blood Moon is a strong addition to the overall tribal and ethno-ambient canon. It will slot in alongside your personal favorites. Capser and Morris have very good chemistry; they are strong tribalists on their own, and this joining of their powers results in a rock-solid release sure to please tribal fans. Available from Spotted Peccary. A little as the reflections of the moon which wrap a too quiet evening in a Jurassic jungle, the introduction of “Lichen Patterns” rises between our ears with an ochred lamentation which is about to reveal the intense nocturnal activities of “Blood Moon”. A mixture of opalescent and blackened synth waves, where some shamanic hoarse grumbles are joining, the opening of “Lichen Patterns” proposes a very sibylline sound shroud before being delicately shaken by a meshing of manual percussions. Then we plunge into the charms of this first collaboration between the designer by excellence of suffocating prehistoric ambiences, Shane Morris, and Frore; a musician whom I don’t really know and whose name is in reality Paul Casper. The aboriginal tom-toms and the knocks of the very metronomic bass percussions are sculpturing a kind of slow trance dance whereas the multiplicity of the synth lines, and their tones so full of particles of prisms than as of perfumes of graphite, exhale ambiences where spectres hum in a sonic fauna to the thousand ambiospherical delights. 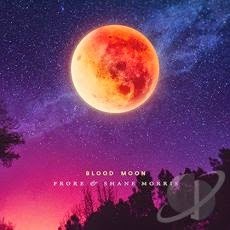 Divided between rhythms of spiritual trance, sculptured by a wide range of ancestral percussions, and rich meditative moods, fed by an impressive pallet of sounds, “Blood Moon” offers an interesting sonic journey where the comparisons between some of Steve Roach‘s pilgrimages into the aboriginal lands cannot simply be avoided. If the percussions seduce, the sonic decorations and the synth soundscapes are not outdone with a plenty of synths lines painted of seductive colors which will capture a hearing in need of adornment and with effects which plunge the same listener into territories bordering virgin appearances. Organic or psychic, electronic or acoustic, esoteric or exoteric; these effects give more brilliances to the percussions which peck nervously at the 5 soundscapes of “Blood Moon”. If “Lichen Patterns” offers a rather relaxing structure, “Ritual Sequence” raises the level of intensity with more hectic percussions. Percussions which plough heathen moods fed by the groans of Didge, the muffled songs of spectres and those of the flutes with a tint of blowpipe. The structure reminds me extremely Steve Roach, especially with those synth lines floating such as long lassoes without preys to catch, in his quest of the Australian deserts with tones and organic pulsations which are smothered by a dense layer of synth to the very ancestral aromas. “Orison” distances itself from the usual style of Shane Morris with a clearly more tribal approach. One would say a ritual dance of the Middle East with lively percussions and with airs of Armenian flutes; the Duduks. If the percussions play a leading role in “Blood Moon”, the rhythms to which they give birth are not less very peaceful here. So, “Unfolding” is closer of Steve Roach‘s ambient tribal universe than “Ritual Sequence“. In fact both titles are closely bound by the same atmospheres, aboriginal flutes in less. If the percussions are also well fed, they are less strong and let glitter ringings of carillons which throw an aura of incantatory mysticism on the most ambient, the most serene track of “Blood Moon”. I like it! And the sonic shroud is filled with small hearing pleasures which are going to delight those who are gourmand of sounds and tones. “Night Rapture” is the highlight of “Blood Moon”. The intro grows slowly with percussions which trace a laborious ascent. Little by little the pace accentuates its cadence beneath muffled growls, which stretch in long reverberations, and synth lines of which some are escaping and form shadows which float like ethereal songs. It’s dark, heavy and insistent. Like an ambient trance! The subtle crescendo is very wrapping. Between the uncomfortable blackness of the nights of agitation and the hypnosis of the continual upward percussions, “Night Rapture” infiltrates our senses with a merciless will of bewitchment. The ambient stubborn rhythm is always climbing these timeless staircases while that some rich synth lines are erupting, such as slow waves rolling with harmonies always a little muddled up which inject a mix of ethereal and sibylline ambiences. This is incredibly mesmerizing. Our eardrums tremble under the din of the percussions. The wild approach of “Night Rapture” evaporates bit by bit after the 12th minute into some shivers and insect noises, ending so a journey at the end of the ominous and fascinating ambiences of “Blood Moon”; an album in the same lineage as Proof Positive and Spiral Meditations by Steve Roach. A very beautiful album which opens new perspectives to the ambient tribal genre, due to the wealth of its rhythms and its soundscapes to the evolutions as much audacious than the ingenuity behind the multiplicity of the patterns of manual percussions. A breeze coming from the time widens a silky fluty blanket. Its dreamlike song raises a thick cloud of drones which eventually float like this light morning mist of which the suspended droplets moisten the dense Neanderthal forests. The dew dried up, the drones breathe within communicative breaths while the wooden jingles are drawing a ghost rhythm. The drumming arouse the curiosity of pulsations isolated in this leafy sonic vegetation from where wake up the stridulations of huge locusts. “Fire Gathering” takes then a tangent unknown in this Inspired Evolution series with percussions which knock down the ambiances became a little more threatening. Navigating in the seas of aboriginal and tribal moods ofSteveRoach, ByronMetcalf and of Mark Seelig, ShaneMorris & Mystified are surprising with a conclusion at least clearly more aggressive than on the first 2 opuses of their trilogy. Between the mysticism of a society disappeared since millenniums and the paranormal of the contemporary tones, “Evolution” always offers these ambiences which are near the spiritual contemplativity as well as an impressive sonic pallet which this time breathe through rhythms as lively as creative. “Fire Gathering” continuous then its sonic breakthrough, just like a Cro-Magnon man discovers the dangers of his territories of hunting. The tension is tangible and each knock of percussions spreads a filmic aura, in addition to sharpening the tones of the heterogeneous noises and the organic jingles which nibble at these hollow vibes and these winds come of between mountains which sneak such as a false soothing wave. Simply sublime, “Growing into New Territory” offers an array of beatings which sparkle and skip in a very dialectical approach. One would say a race of fragile small-steps which avoid the same traps, while the lines of synth are spreading an ambient soundscape, and so very soothing, which covers a forest half sleepy. “Waiting for the Storm to Pass” reminds me the ambient, organic and shamanic rhythms from the tandem Roach/Metcalf. In spite that the track remains quiet, we feel a threat floating throughout its 13 minutes. ShaneMorris & Mystified may claim to create a prehistoric tone, at times we believe in it firmly, that the spectral approach of a secret society also perspires all through the 60 minutes of “Evolution”. And this even if we dive in the heart of luxuriant aboriginal vibes with “Waiting for the Storm to Pass” and its frame-drums’ tomtoms which make us travel just like being on the wings of a huge insect and flying with the wave-like of synth lines. The breaths of caves and the long drones, all both rather musical, decorate the ambiospherical intro of “Hunting in the Hills”. The fusion weaves a rather serene approach. Other more resonant synth lines are spreading some iridescent curves among which the magnetic singings and the reverberating pads arouse the awakening of the cymbalisation of the wooden cicadas. Hollow voices, which borrow the tones of frame-drums, and shamanic rattlers are quietly driving the serenity of “Hunting in the Hills” towards a more frightening passage, drawing the images that we visualize of a prey at the end of its resources. “The Trials of Evolved Man” seduced just as much with its docile pulsatory rhythm. The movement of the pulsations may be sustained; one would say an ambient techno with these jingles which adorn its parasitic gravity, that it awakens not at all the passivity of the synth lines, rather musical and very soothing I have to specify, which float such as the caresses of the gods on a fauna torn between its peace of mind and the rebellion of its mini-inhabitants. This very beautiful track throws a magnetizing crescendo, plunging the listener into a fascinating morphic state and so looping the loop of a trilogy of which we already regret its final part. “Evolution” is a surprising album of ambient music which rivets the eater of sounds that we are in a mode of constant listening. A rather unique exploit for an album of ambient music. The soft rhythms, the caresses of synths and their unique electronic dialects, as much as those brilliant acoustic percussions coupled to the multiple quirky tones give a rather unique sonic texture which exceeds even the borders, nevertheless splendidly defined by Steve Roach and his accomplices, of a landscaped and aboriginal music. 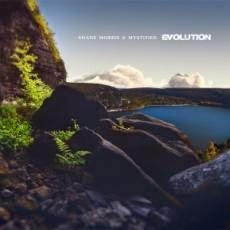 This is the very beautiful album that offers usShaneMorris & Mystified . One of the best in the genre. Magnetizing, bewitching and simply superb!